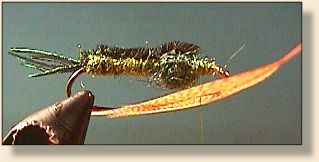 DeFeo Style Throat Hackle - Volume 6, Week 22 Fly Angler's OnLine"
On the FAOL Bulletin Board there was an inquiry about Charles DeFeo, a well respected fly tier. Seems a person was tying an Orange Hair Backed Prawn and the recipe calls for a "Defeo style hair hackle." Well I pulled out my trusty The Fly Tier's Benchside Reference by Ted Leeson and Jim Schollmeyer (Frank Amato Publications), went to the appendix in the back and found two listings for Charles DeFeo. The first was the "DeFeo Throat Hackle," and the second is the "DeFeo Side Mounted Bundled-Fiber Legs." 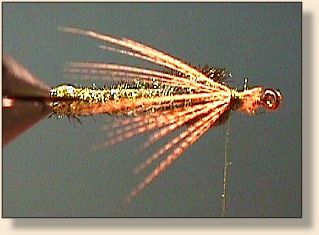 I have used the "DeFeo Style Throat Hackle" on many fly patterns calling for a hackle style beard. It is a simple and effective way of tying. 1. Select a feather where the barbs are of equal length on both sides of the stem. 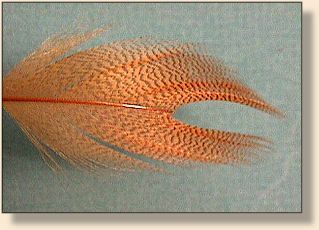 The feathers stem is snipped to remove the tip of the feather, creating a V-shape feather. 2. Stripping away the lower barbs on the feather stem to adjust for the final fullness of the beard (throat hackle). 3. 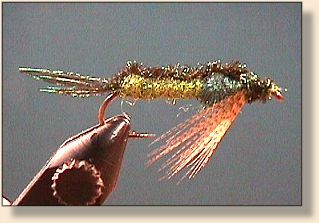 Position the feather under the fly, with the separate sides of the feather on opposite-sides of thread hanging beneath the hook. Some feathers have a natural curve, so proper position of the barbs is important before securing the hackle to the hook. 4. Pinching the feather, on both sides of the hook with your fingers, do two preliminary thread wraps under moderate tension. 5. With moderate tension on the thread, pull the feather stem forward, sliding the hackle barbs thru the thread loops, until the you have the length of throat-hackle you want. 6. After you have completed the final positioning, do additional tight thread wraps to secure. Secure with a half hitch, then remove any excess material. Credit: Information from The Fly Tier's Benchside Reference by Ted Leeson and Jim Schollmeyer, published by Frank Amato Publications.